In just a few days, I’ll be heading out to Indianapolis to participate in Indiana Comic Con! This will be my first time at this particular con, and I’m looking forward to it immensely. 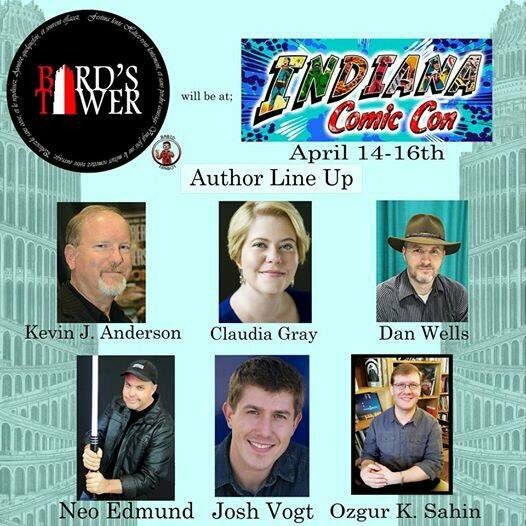 I’ll be there with the Bard’s Tower team (aka the “tower of power) and a lineup of other amazing, award-winning, and bestselling authors. We love meeting everyone we can at cons and are, of course, always happy to sign our books for you. Interested in creating your own fictional world? Join this panel of professional world builders as they discuss the process of creating universes in Sci-Fi, Fantasy, and Horror genres. As a quick aside, if you can’t make it next weekend for some reason, I’ll be back in August to take part in Gen Con’s Writer’s Symposium. But hopefully we’ll see many of you soon at Indiana Comic Con!